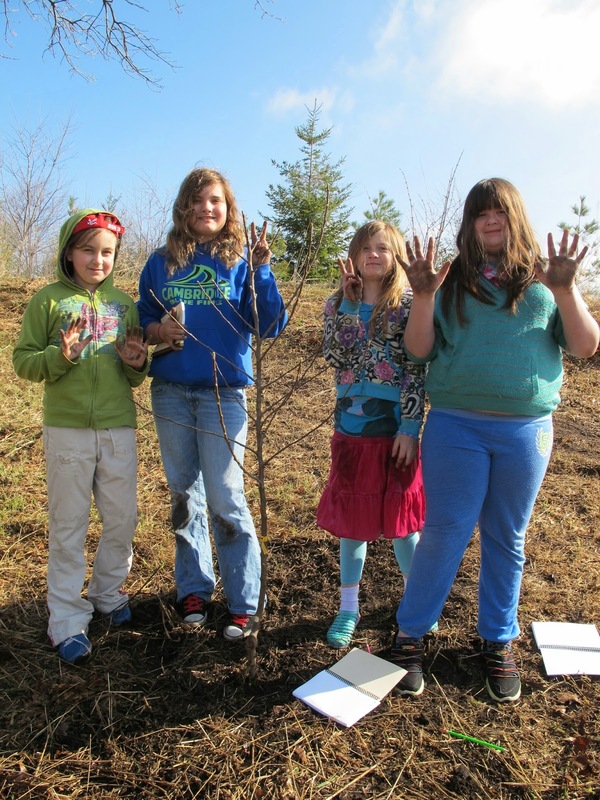 It was another successful Earth Day/Arbor Day celebration here at Arington Tree Farm. Each year we invite the Fourth grade class from Cambridge Elementary School, as well as the students of Walbridge, our partnership school, to join us in celebration of Earth Day and Arbor Day. We break them up into five groups, to rotate through stations and learn about different aspects of the environment. This years stations included Tree Planting, Birds of the Farm, Aquatic Plants and Wildlife, Tree Cookies and The Good Oak. 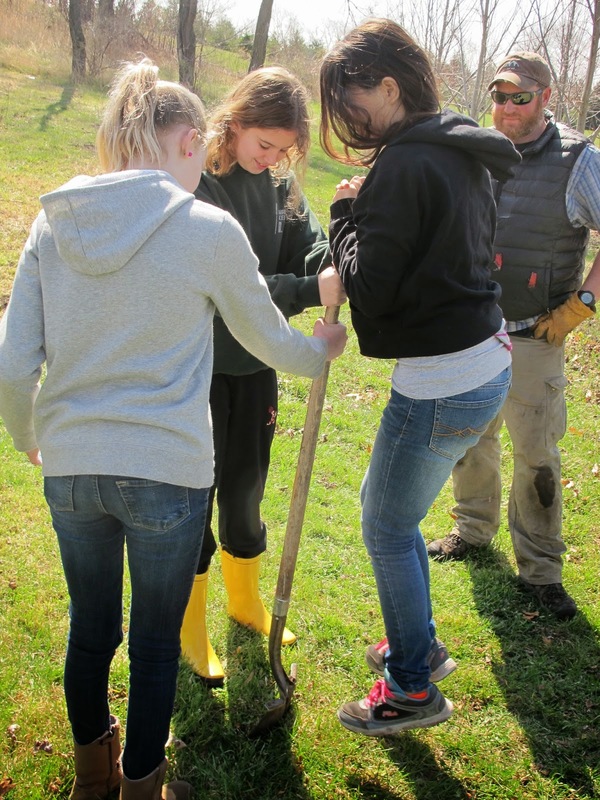 For Tree planting, the students took turns digging holes and planting trees that will live here on the farm. They were taught the importance of planting trees and how to properly plant them. They were assisted by the interns of the Aldo Leopold Foundation, as well as our staff here on the farm. Students of Cambridge gather around a planted tree. Students of Walbridge digging away. From there, they moved on to Bird watching. They were guided by Dan Schneider from WDNR. 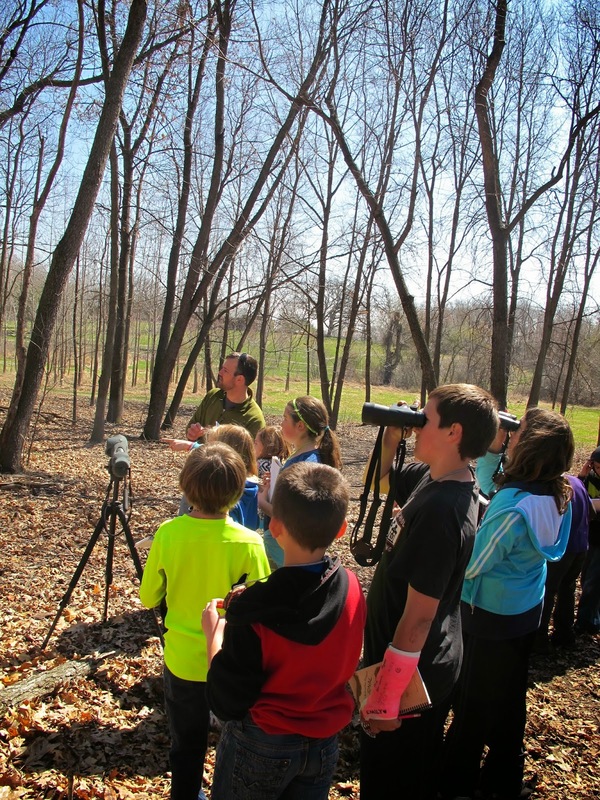 Dan taught the students different bird sounds to help them identify the birds that live here on the farm. They also used binoculars to get a closer look and to identify where the sounds were coming from. The next station they visited was Aquatic Plants and Wildlife lead by Clare Carlson from Friends of Glacial Heritage Area. Clare used games and a tour of the pond to teach the kids how water plays a crucial role in supporting wildlife, plants and a healthy ecosystem. The Fourth Station, Tree Cookies, was a chance for the students to learn about the rings of the trees and what these rings can tell us. They were lead by Loren Hanson of the WWOA Blackhawk Chapter. Loren had the children examine an old stump to see what they could learn from it. They also used this time to decorate individual tree cookies. Students checking out a tree stump and it's rings. Making tree cookies of their own. The final station, The Good Oak, was lead by Carson Main from the Aldo Leopold Foundation. Carson used our signature Oak tree to discuss with the kids the Oak trees age, what the tree has seen and experienced through the years, and how this applies to the students and their own lives. He had the students use journals to draw their own tree rings and to describe, as best as they could recall, something significant that happened to them during each of these years of their lives. Students gathered under our signature Oak Tree to learn about the Good Oak. We finished the day with the Walbridge students, the Cambridge students had to head back at lunch time, painting the picnic tables they had constructed during their visit in March. They also had some free time to fly kites and adventure around the farm. We couldn't have asked for a better day or better company. We look forward to doing it all over again next year. I'd like to extend a special thank you to all of our volunteers who made this event possible, Loren Hanson, Carson Main, Dan Schneider, Clare Carlson, Holly Schnitzler, Marie Burgette Bach, Kristin and Russ Stockwell and Dain, Dan, Carl and Emily, interns at the Aldo Leopold Foundation. It couldn't have gone on without you.